Nick Munoz, founder and president of Dating Trojans, has lamented the hook-up culture present in USC’s party scene since his freshman year. He was never drawn to the excitement of the night life that attracted many students. Instead, he sought substantial relationships but found a lack of options in the USC community for students to meet and interact with prospective partners. The idea came to Munoz when he was in New York, in an environment completely different from USC. Love at first sight · Dating Trojans is USC’s first club dedicated to forging new relationships with others through activities like speed dating. The club hosted its first speed dating event (above) on Friday. “I saw that many colleges in New York had speed dating. 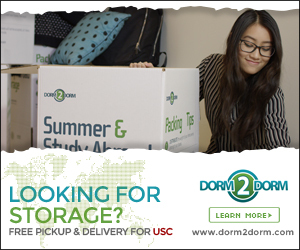 So I thought, why not bring the idea back to USC?” Munoz said. It took him a year to follow through with this idea, and through his entrepreneurship class, Munoz was able to turn speed dating into a feasible project by forming a club called Dating Trojans. 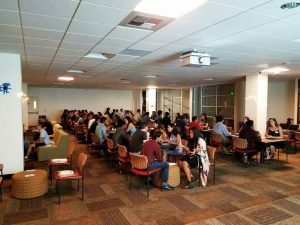 On Friday, Munoz and the executive board of Dating Trojans hosted their first ever Speed Dating session that was open to all USC students. The lights were dimmed and the candles were lit in King Hall, as the club aimed to create a romantic ambience for the 60 students present at the session. Upon arrival, each student was presented with a name tag, a pamphlet and a pen for keeping track of names throughout the event. Seating was arranged carefully, according to the gender preference students provided in their speed dating RSVP. For some students, the event served as a unique way to meet new people, and many came with a group of friends to try out speed dating. “We’re so used to different forms of meeting and talking to people besides, well, face-to-face interaction,” said Laura Gouillon, a junior majoring in computer science. 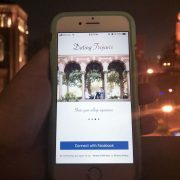 Dating Trojans aims to counter the impersonal matchmaking system in popular dating apps like Tinder and instead provide an authentic space for individuals to meet. The event largely attracted students’ attention because many had never had the opportunity to speed date before. “It’s something I wanted to check off my bucket list,” said Connor Cogdill, a freshman majoring in economics mathematics. Students came with an open-minded attitude, regardless if they were looking for love, friendships or a unique experience. For each speed dating rotation, the women stayed in place while the men moved a seat over. Each pairing was given three minutes to exchange names and interact, and at the end of the event, students were able to fill out a survey e-mail for their potential matches. The event started at 7:30 p.m. and ended after 9 p.m., giving Trojans a chance to connect with a wide variety of individuals, even if conversations lasted only for about three minutes. Dating Trojans’ goal, however, is not to simply match-make students. The club aims to host events in a safe environment that promotes inclusivity and aspires to bring together Trojans from all different backgrounds. “We’re planning on doing an event for graduate students specifically and one for LGBT students as well,” he said. So far, Dating Trojans plans to host a monthly speed-dating session, but they’re open to the possibility of having holiday or themed mingling events in the future. “Dating Trojans aims to bring together students who seek an alternative from the hook-up culture and we hope our club will create a safe place for people to meet,” the executive board said. The new club is still a work in progress for Munoz and the executive board, but they have high hopes for future events.